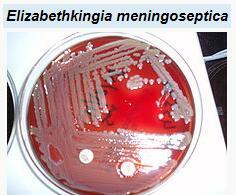 Elizabethkingia is a ubiquitous, multi-drug resistant, gram negative aerobic bacillus that on rare occasions causes opportunistic infections in (mostly immunocompromised) humans, and is viewed as an emerging nosocomial pathogen. In 2012 an outbreak at a London hospital infected 30 patients (see EID Journal Waterborne Elizabethkingia meningoseptica in Adult Critical Care) with infection associated with water sources in the critical care unit. Another outbreak, also in 2012, reported in the Indian Journal of Critical Care (see Elizabethkingia meningoseptica: Emerging nosocomial pathogen in bedside hemodialysis patients) isolated this organism in the hospital unit's handwash sink and water supply. Frankly, there's not a lot in the literature about outbreaks (a PubMed search of `Elizabethkingia outbreak ' returns only 9 papers). The genus Elizabethkingia includes not only E. meningoseptica, but E. miricola, E. endophytica, and E. Anophelis - which in 2011 was found in the gut of the found in the gut of the Anopheles gambiae mosquito (cite). All of this serves as prelude to a press release from the Wisconsin Department of Health describing a cluster of 44 recent Elizabethkingia infections in Southeastern and Southern Wisconsin. For now, the cause of this outbreak is undetermined, but state and CDC disease detectives are investigating. The Wisconsin Department of Health Services (DHS), Division of Public Health (DPH) is currently investigating an outbreak of bloodstream infections caused by bacteria called Elizabethkingia. Illness associated with Elizabethkingia typically affects people with compromised immune systems or serious underlying health conditions, and can lead to death. While 18 patients who tested positive for the Elizabethkingia infection in this outbreak have died, it has not been determined if the cause is the bacterial infection, or the patients’ other serious health conditions, or both. DPH was first notified of six potential cases between December 29, 2015 and January 4, 2016 and set up statewide surveillance on January 5, 2016. DPH then alerted health care providers, infection preventionists, and laboratories statewide of the presence of the Elizabethkingia bacteria, and provided information as well as treatment guidance, which has led to a rapid identification of cases, and appropriate treatment. Following identification of the initial cluster, DPH staff initiated epidemiologic, laboratory and environmental investigations to further characterize demographic and epidemiologic features and determine risk factors and potential reservoirs for infection. DHS and our partners are working closely on the investigation to determine the source of the bacteria, and are working diligently to contain the outbreak. A team of epidemiologists and laboratory partners from the Centers for Disease Control and Prevention (CDC) is on site assisting with the investigation. DHS is also working closely with state and local partners including the Wisconsin State Laboratory of Hygiene, infection preventionists, and clinicians in Wisconsin. DHS will continue to offer updates as information is available, to help ensure the health and safety of those who may be vulnerable to bloodstream infections caused by the Elizabethkingia bacteria. For more information go to: https://www.dhs.wisconsin.gov/disease/elizabethkingia.htm.